Enless Soft - Joomla! Extensions - Title Manager - News - Upgraded to Joomla 1.7! Enless Soft Products Joomla! Extensions Title Manager News Upgraded to Joomla 1.7! We are happy to inform you that Title Manager now supports Joomla 1.7! The new version of Title Manager is 1.7, reflecting the Joomla version. As always, all of our customers who purchased previous version of those products, can download the new versions for free. If you are an existing customer, just log in to your account and head to the download section of Title Manager. You will find all installation packages there. If you are a new customer, proceed to the online purchase page. 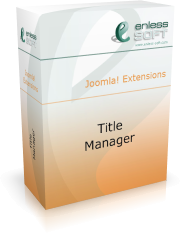 We also released an evaluation version of Title Manager for Joomla 1.6 and 1.7. Previously, only Joomla 1.5 evaluation was available. An evaluation version is fully working version which expire after 20 days. This is a great way to see if the product works for you, using your own real-world environment.